Innovation is becoming the lens through which leaders are directing a laser-like focus on business transformation. It’s easy to see why. Margins and product life cycles are shrinking, competitive pressure is growing, and the need for customer responsiveness has never been more important. Every company needs an edge. Enterprise innovation is not the sole domain of the entrepreneur. It can be practiced by CEOs of large firms, too. Before Conant and Hassan assumed control in 2001 and 2003 respectively, both companies had allowed their brands to lose luster and were in a downward spiral in their respective markets. Campbell‘s declined to the point where the Torrance Family, owners of the majority of the 140-year-old company, decided on a complete reorganization. Schering- Plough was losing patent protection for its leading product, Claritin, as well as experiencing a sharp decline in its $1 billion hepatitis C business. Both CEOs approached their similar situations with determination and a belief that the right team and the right focus on innovative customer solutions could reverse these trends. While using different acronyms and employing different tactics, both CEOs saw team building as the cornerstone for their transformation strategy. Based in Camden, N.J., and employing 23,000, Campbell‘s is an $8 billion maker of simple meals, including soup, baked snacks and beverages. Its products, representing 20 brands, are sold in 120 countries around the world. Doug Conant, who brought 25 years’ experience from General Mills, Kraft and Nabisco, used a concept perfected by the Gallup Group called the Engagement Ratio. The theory is that to have a team dedicated to the company vision and mission of total customer satisfaction, the majority of the employees must be fully engaged in their respective jobs. Gallup‘s premise is that to reach world-class levels of productivity you need to have 12 engaged people for every one actively disengaged. Conant reckons Campbell‘s engagement ratio in 2003 was no better than 2 to 1. By 2007, this was changed to 9 to 1. Fred Hassan, on the other hand, began by developing a document on Leadership Behavior that he shared with all employees. It was a motivational explanation of how to approach individual day-to-day responsibilities so that Schering-Plough would be delivering the best customer experience possible. This document captured his philosophy on a variety of critical management issues like teamwork, customer focus, quality, engagement, leadership, culture, competitiveness and communications. Hassan prepared his treatise because, when he took over in 2003, he found the behavior of the team he inherited, compared to industry standards in terms of quality, engagement, leadership, working climate, competitiveness and communications developed by Towers Perrin, was negative on almost all points. As a result of implementing his team-building strategy, by 2006 all of the critical management factors were positive and growing. In terms of the management team, Conant replaced 300 of the top 350 leaders in the first three years. But of this group, 150 were promoted from within. His initial observation of the team he inherited upon taking over was that the only reason they were still there is because they could not find jobs anywhere else. This was also evident in Gallup‘s initial survey of engagement ratios. Hassan replaced the entire top management team he inherited in his first 18 months. After carefully evaluating each position he felt that to save the company and transform it he needed a very strong set of new executives that he hand picked, function by function. 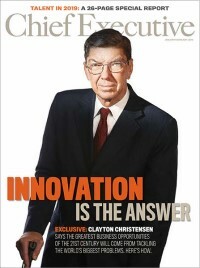 Conant developed a 10-year plan called “The Campbell’s Journey” around his concept of focused, mission-driven innovation. Broken down into three phases beginning in 2001, the first was the Transformation Plan from 2001-2004, the second was the Quality Growth Plan, and the last, currently under way, is the Building for Extraordinary Growth Plan from 2008 to 2010. The mission is to build “the world’s most extraordinary food company” which he equates to “a sustain-ably good company.” In the first three years, Campbell‘s went from being non-competitive to competitive by upgrading the management team, improving employee engagement and working on innovative product improvements. In the next three years, the target was quality growth through enhancing the overall value proposition for customers and above average total shareholder returns. As a result, earnings per share has improved every year for six straight years in a very competitive marketplace. Today, the goal is to deliver the best total shareholder returns in the food group. Since 2005, Campbell‘s has delivered a higher return to shareholders than the S&P Packaged Foods Group. Campbell‘s set the following targets: to grow sales by 3 to 4 percent, adjusted earnings before interest and taxes by 6 to 7 percent and adjusted earnings per share by 5 to 7 percent. The biggest problem Conant’s team faced was the overall deterioration in the company’s biggest volume category-soup sales. The company was selling basically the same old soup packaged in the red-and-white cans that generations of moms and dads grew up on. Competition, on the other hand, was offering healthier, more wholesome soup packaged in more attractive, easier to use cans and in sizes more in keeping with current customer consumption requirements. Campbell‘s was stuck in a mass-market mode of thinking, while competitors like Progresso and other specialty soup makers were successfully implementing niche market strategies. Conant’s team noticed early on that supermarket customers had difficulty finding their favorite soup on the shelf. The competition, how- ever, had visible shelf space that appealed to consumers. A time study revealed that customers do not want to spend more than 20 seconds looking for a particular soup. But the same study indicated that it took consumers 70 seconds to find a similar Campbell‘s soup. Furthermore, the arrangement of its soups was confusing and labels were hard to read as compared to competitive brands. The solution: a new shelving system, easier to read labeling and healthier soups. In addition, the team added simple innovations like pop-top cans that increased sales of their condensed soups 8 percent in 2005 and another 5 percent in 2006. They also introduced lower sodium soups with natural sea salt. Campbell‘s current portfolio consists of 43 varieties of reduced sodium soups with over $400 million in sales. The team simultaneously began to upgrade product quality. By 2003, the company launched a new line of products, starting with microwaveable healthier soups that are now a $300 million business. In addition, the company rebooted its international marketing strategy by targeting two giant foreign soup markets: China and Russia. The two largest soup consumption markets in the world, both are dominated by homemade soups. Campbell‘s put researchers in homes in both countries to conduct ethnography sessions to determine these customers’ deeper cultural values associated with soup. As a result, the company came up with a way to create a consistently higher quality broth that saved between two to six hours in the household soup preparation process. This gave the firm another successful major new market entry strategy. Conant’s goal is to increase total shareholder returns by achieving exceptional employee engagement. Doug says, “Extraordinary things are achieved by people determined to leave a legacy.” Among the top managers, Campbell‘s 2007 engagement scores were 35:1, up from 8:1 in 2003. Campbell‘s was also awarded the Gallop Great Workplace Award, which recognizes the most engaged and productive companies in the world. From 2002 to 2007, sales grew from $5.8 billion to $7.9 billion with a 6 percent five-year CAGR. For Campbell‘s 2008 fiscal year, while soup sales increased by only 2 percent in a tough economy, beverage sales increased more than 10 percent, resulting in overall profits of $1.17 billion, up from $ 854 million in 2007. Based on these results Conant reiterated his expectations for a 5 to 7 percent earnings increase in the coming fiscal year. Given the economic circumstances since then, it will be challenging for any company, including Campbell‘s, to achieve these expectations. However, Conant and his team are positioned to weather the economic storm with a line of food products for the masses. We all have to eat, even if it is more hearty beverages and healthy soup than before. Fred Hassan was working his plan during this same time period. Although operating in a highly regulated industry with technical constraints, he was, like Conant, focused solely on customers. “The most critical engine of innovation in any organization is a passionate attitude of customer focus and people who are liberated to pursue that passion,” he said. His team started by studying the market for Claritin, which had switched from a prescription to an over-the-counter (OTC) product in December 2002. Claritin had been the No. 1 product in the prescription market, bringing in more than $2 billion in annual sales. By the end of 2002, Claritin sales in the U.S. had declined significantly due to patent expiration. The campaign was launched in 2004 with a series of commercials that illustrated the patient benefits of the product. Building on consumer insights around a “foggy-to- clear” presentation, the innovative messaging contributed to Schering gaining market share in the U.S. This campaign was followed by a series of similar innovations designed to deliver a better consumer experience. The team broadened the Claritin product franchise through a series of line extensions and product re-formulations, such as a new chewable form, improved syrups for children and a greater emphasis on Claritin Redi-Tabs (easier to swallow because they dissolve in the mouth). Hassan also focused his team on prescription pharmaceuticals R&D. The average commercial life of a branded portfolio product in pharma is about 10 years. So renewing the product portfolio became the key driver. Hassan inherited an R&D spend of less than $1.5 billion. By the end of 2007, he raised that to nearly $3 billion. One beneficiary of this investment was Remicade, a product first launched in 1999 for rheumatoid arthritis. By investing in clinical research to investigate new applications, Schering identified and received regulatory approval for six additional indications; psoriatic arthritis, adult Crohn’s Disease, pediatric Crohn’s Disease, ulcerative colitis, ankylosing spondylitis and plaque psoriasis. As a result of these indications and growing demand, Schering-Plough’s sales for Remicade increased from $349 million in 2003 to more than $1.6 billion at the end of 2007. The company revived another older product, Nasonex, a spray for allergies. Research indicated that patients wanted an unscented form of the product. Working side-by-side, scientists and manufacturing teams reformulated the product without the rose-scented alcohol ingredient. The marketing team then focused on an overall brand transformation- building a blockbuster in just a few years. By educating patients on allergy symptoms and promoting the unscented formula with a series of “Bee” animated commercials, the product generated over $1 billion in 2007 sales globally, more than double the sales in 2003. The work on Claritin, Remicade and Nasonex demonstrated the power of listening to customers and close collaboration among research science, marketing and other parts of the company. The overall cultural change implemented by Hassan’s leadership behavior model and emphasis on innovation has proved successful, especially at a time when the industry is seeing a drop in the productivity of more traditional R&D work. From 2004 through 2007, Schering delivered a total shareholder return of 41 percent, the best among its peer group. Sales went from $8.6 billion in 2003 (when Fred Hassan arrived) to $15.2 billion in 2007, a CAGR of about 15 percent. What these two CEOs accomplished working independently of each other after inheriting similar circumstances speaks to the power of team building and motivation by CEOs with a vision and steadfast focus on innovation. This is not to say that either CEO doesn’t have continuing issues with competitors. The global marketplace never stands still, and technology always evolves. Campbell‘s continues to have a serious competitor in industry giant HJ Heinz. Last year, Campbell‘s sold off Godiva, a line that did not “fit” its mission, and purchased the complementary Wolfgang Puck line of soups, but there is more work to be done to achieve the goals Conant has set for the future in a U.S. soup market where it already has a 70 percent share. Schering, on the other hand, has had a few bumps recently with the recent disclosure that its cholesterol drug Vytorin does not achieve the expected results, as initially promoted, against the cheap generic form of Zocor. Sales declines resulted in job losses and may impact forecasted future results. Bob Donnelly writes the online “Entrepreneurial CEO” column for Chief Executive.